New York (AFP) – The Green Bay Packers invited their fans to join the players and coaches in linking arms before Thursday’s NFL game against the Chicago Bears as patriotism replaced protests on Thursday. 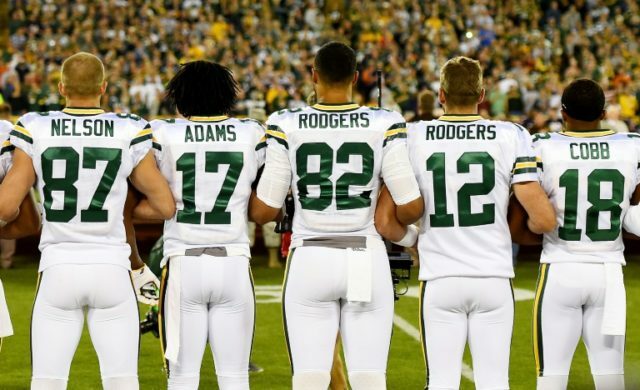 In a request for a show of unity, the Packers had asked fans to join the players from both teams in linking arms during the playing of “The Star-Spangled Banner”. While some small groups obliged, the majority of the Lambeau crowd either held a hand over their heart, stood at attention and saluted, or waved small American flags. The NFL players say they have been unfairly criticised and that the sitting, kneeling and raising of clenched fists during the anthem is to draw attention to racial injustice in America, and not specific protests directed at the flag or anthem. NFL owners met with commissioner Roger Goodell and a handful of players for several hours in New York on Tuesday night to discuss the anthem protests.